Once you have a morphing sequence, you can add a morphing key drawing. 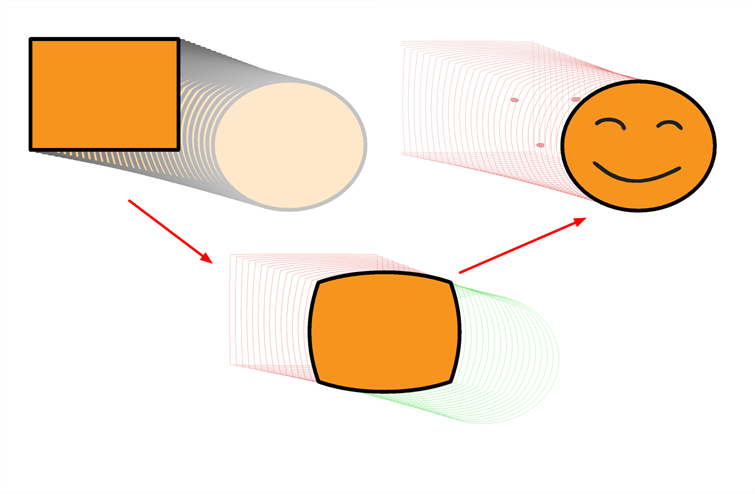 A morphing key drawing allows you to insert extra details into a morphing sequence. For example, during a morphing sequence you may need to insert a detail such as teeth or a mouth; this is easy to do when you use a morphing key drawing. Instead of creating an entirely new drawing, convert a computer generated in-between to a morphing key drawing and add your extra details to it and the next key drawing. A morphing key drawing converts a computer-generated morphing frame into a real drawing that you can edit. It splits the morphing sequence into two sequences, retaining any previous modifications. In the Timeline or Xsheet view, select the morphing frame you want to transform into a morphing keyframe. ‣ In the top menu, select Animation > Morphing > Insert Morphing Key Drawing. ‣ Right-click and select Morphing > Insert Morphing Key Drawing. The new morphing key drawing appears. In the Drawing or Camera view, draw your new details on the morphing key drawing.